Electraeon Stealth Series Derby Covers for Harley Davidson Motorcycles. 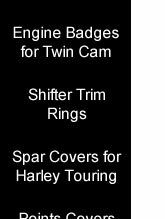 Stealth Series Derby Covers for Harley Davidson Motorcycles. Stealth Series Derby Covers are CNC machined from 6061-T6 billet aluminum and finished in Black Wrinkle powder coat to match Harley Davidson Night Train, Street Bob, and Fat Bob motorcycles. Street Bob Derby Cover. Night Train Derby Cover. Fat Boy Custom Derby Cover. Street Glide Custom Derby Cover.